While public water supplies are heavily regulated by the US Environmental Protection Agency (EPA), private water supplies, particularly well water supplies, are not usually covered by the regulations for drinking water. So, if you have a private water supply, such as a well, it is your responsibility, as the owner, to test your well water on your own and ensure it’s clean and safe for use by your household. 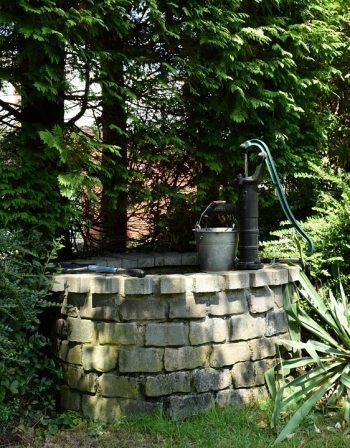 Your private well can be loaded with many different contaminants that can make their way into the water supply, this is mainly attributed to the nature of the groundwater. The presence of these harmful contaminants depends on the possible ground sources around the area of your water source, and each contaminant may have potential ill effects on human health. That’s why it is very important that you know what types of contaminants are lurking in your own private well, and what ill effect each specific contaminate may have on your family. In most cases, hard minerals with the accompaniment of iron are the main cause of well water contamination. Thanks to the best water softeners for hard well water, all of these hard water deposits and contaminants can effectively be removed from your water. How Effective Are the Best Water Softeners For Hard Well Water? Hard water is a frustrating problem that’s caused by high levels of calcium and magnesium in your well water. Over time, the damaging effects of hard water on your plumbing system, appliances, and clothes can become quite costly. Scaling on sinks and fixtures is very ugly and makes equipment less efficient, requiring untimely repairs or replacements. So, to reduce or eliminate hardness from your water supply, investing in the best water softeners for hard well water will be a great long term investment! Conventional water softeners, also commonly known as salt-based softeners, can effectively removes hardness minerals by means of ion exchange process. This water softening method trades off hardness ions, (calcium and magnesium) for harmless salt ions, sodium or potassium. Soft water saves you multiple hours in cleaning as the soaps and detergents will now lather nicely, what’s even nicer is that you’ll love how soft and shiny your skin and hair will become. Now, you might want to rush and get your hands on one of the best water softeners for hard well water you can find, but wait, how do you know which product is best? 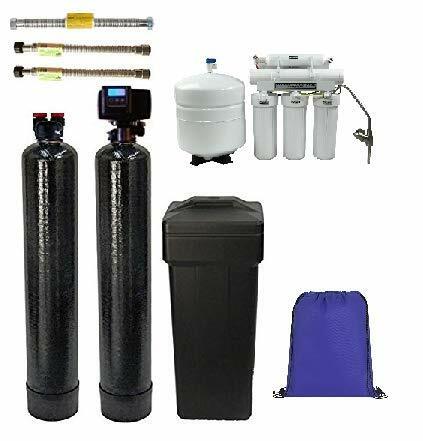 What makes this system very attractive to many private well owners is that it comes as the entire solution for treating your entire household, it’s a triple combo package, including a whole house water softener system, an up-flow carbon tank, as well as a 5-stage reverse osmosis system. All of these treatment solutions at an affordable price! Setting aside the contents of the package, the system is obviously of top quality by featuring the most trusted and on-demand digital valve meter, the Fleck 5600sxt. This is a top-notch technology that will ensure soft water that’s not only beneficial for your drinking water, but for your hygiene, too! Another big plus is that you’ll get the upgraded system with 10% more cross-link resin, this means that it can hold up much better and longer than the typical 8% resin technology. When it comes to capacity, this water softener is perfect for you if there are maximum of 5 people living in your home, it has a 48,000-grain capacity that’s specially designed to treat hard well water levels between moderate to very hard at 12 GPM flow rate. Not only that, if the tests you performed on your well water show other contaminants present, both the up-flow carbon media and reverse osmosis (RO) offer powerful filtering capacity. The carbon filter effectively deals with the bad tastes and odors of most chemicals, while protecting and prolonging the life of your water softener resin. The RO eliminates up to 96% of most harmful contaminants including bacteria and viruses, organic chemicals, a wide range of toxic heavy metals, nitrates, fluoride and many more. The end results? The purest water for your whole household to enjoy. You can wave goodbye to frustrating scale buildup and say hello to shinier dishware and clothing. Let’s also not forget one big upside of using the sophisticated system, it regenerates based on the countdown of the gallons used with even some reserve, this means you won’t need to worry about the tank running out of soft water. On top of all that, both softener tanks comes with a great warranty of 10 years!, that’s how confident the manufacturer is in the quality of the product which is also American made. All things taken into consideration, it’s no wonder why ABCwaters Triple Combo Water Softener System is listed among the best water softeners for your hard well water. So, if you are daydreaming about bathing under soft water for that ultra-fresh and clean feeling, you can turn this dream into a reality, and don’t forget about the carbon filtration and reverse osmosis system. This is a winning combination that provides you with a complete water treatment facility in the comfort of your own home. Previous Post Highest Rated Water Softener: Tier1 High Efficiency Next Post Is Water Softener Salt Safe for Pets?